In this review, we’ll be looking at some of the best AR cleaning kits along with some of the best carbon removal tools. A standard universal cleaning kit is not really designed for the M-16, AK, or M4 and may not come with the right sized brushes. That’s why we wanted to take a look at the best cleaning kits on the market that are specially designed for these models. For this review, we looked at all of the top AR cleaning kits on the market to find the best AR cleaning kits. Many brands don’t market their cleaning kits specifically for AR but we will be looking at all cleaning kits that work with .22/5.56 caliber firearms as well as cleaning kits that are designing just for the AR. I’m a big fan of the Real Avid products and have been using their products for a couple of years now. 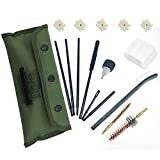 This .223 / .556 kit comes with everything you need for your AR and also comes with the best AR cleaning tool. I really like that this kit comes with 500 cleaning patches and a 7 piece cleaning rod that extends to 33” and fits into a small 8” carrying case. The gun case is heavy-duty ballistic nylon and weighs 3 pounds with everything in it. The threaded brass cleaning rods are pretty nice, a lot better than what comes with most kits. The field guide is another nice addition, which will show you everything you need to quickly assemble and disassemble your AR. This tool is one of my favorites and really it’s all you need to keep your AR-15 clean. If you ask me this tool should come in EVERY Real Avid kit but since it doesn’t you have to get it separately or with this kit. For any AR15 owners out there you know how difficult it can be to clean all the carbon from the nooks and crannies. A good bore snake and this tool will handle most of your cleaning needs and of course the cleaning brushes once in a while. An old military buddy of mine introduced this tool to me and It’s by far one of my favorite multi tools for removing carbon fouling. When you first look at the tool it has a weird deign and takes a little getting used to. It comes with instructions on how to clean every rifle surface. You will soon realize that this tool is precise and very well thought out. The angles and curves, hook and millings really do allow you to get into every possible area of about 99% of firearms. As usual with any gun cleaning kit, most people don’t like the design of the cleaning rod. This one I will admit can be a pain to put together all 7 pieces and then disassemble it. This would be my biggest complaint with this kit and you should probably look into a one piece 33” cleaning rod to save you time. 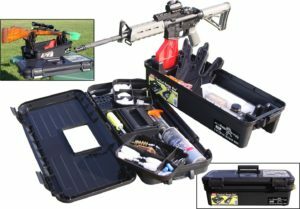 The two most popular AR15 cleaning kits are this one and the Real Avid. Both are perfect for cleaning all M-16, AR 15, and M-4 firearms. I’m a big fan of the Otis memory-flex cleaning rods and have been using them for a couple of years. For those that aren’t familiar with these rods, you attach your piece to the rod and then it slides down the barrel the same way that a carbon fiber cleaning rod or brass cleaning rod works. It saves you time attaching the pieces required for a 30” barrel. The brushes are the quality you would expect from Otis Technology and are probably the best brushes you can get. The chamber brush is a bit smaller than I like which is why I have several different sized brushes that I purchased separately from Otis. The carrying case is the standard small black nylon bag with a belt clip. There’s enough room in the bag for a small bottle of gun cleaning solvent and a few other tools. The Otis flexible cleaning rods work with many types of firearms but the AR15 pattern rifles need the bold carrier cleaned every time after firing the his cleaning rod can be difficult to do that. The locking lugs are another thing that needs a good cleaning on the rear of the barrel, which is why you should look into a carbon removal brush. Overall, this is not really they kit you want if you’re going to be firing your AR on a regular basis. The tools just don’t do a good enough job to clean it well enough. It’s more of a range kit that you would take with you once in a while to clean your gun before and after firing. I purchased this Tipton nylon brush set a while back and thought I would add it to the list. It’s not an entire kit but these brushes are very high quality and very inexpensive. Tipton makes the best gun cleaning rods and you can simply purchase a 32” rod and this kit and you’re good to go to clean about 99% of rifles. 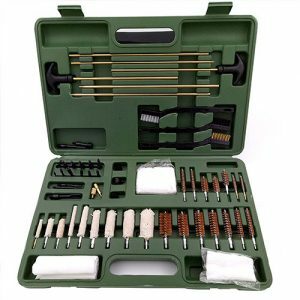 The price of many kits is equal to that of a good cleaning rod and this 13 piece brush kit. The only other thing I would add is a carbon removal tool and of course some good CLP. The quality of these brushes are comparable to any others and the price is great The brushes are made of bronze and I haven’t had one bristly fall off yet. Many of the rifle kits come with one or maybe two brushes. I would definitely think about getting more than 1 brush if I were you and these are the best brushes I have used. When I bought these a while back there were no reviews and now there are plenty of good reviews and no bad ones. The brushes do what they say and they are high quality. We wanted to a look for the best affordable AR cleaning kit and I think we found it with this one. Certainly, you don’t want to use this kit as your primary kit but it looks great for taking to the range or in the field. I really like the olive-green color and it has a simple pouch design. Simple but effective, this kit does what it says. The pouch is large enough to hold a small bottle of CLP and a few other cleaning items. It comes with a cool little clear plastic bottle to store your CLP as well. The bronze brush is designed to fit only the AR and this is an AR kit. It weighs less than a pound and measures 10 inches by 3.5″. For the low price, you can’t expect much. 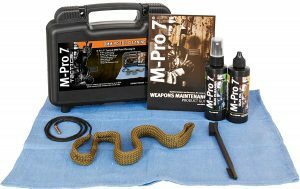 This kit is by no means a full cleaning kit and would be a secondary or backup cleaning kit for your AR. The three-piece cleaning rod is not the best and the brand is relatively unknown, so if you don’t want to take a gamble I would opt for the Otis kit instead. 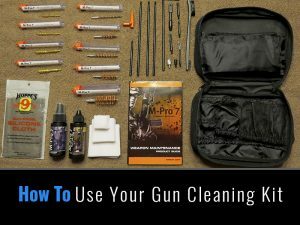 Choosing the best AR cleaning kit is a tough task. We really like the Real Avid rifle cleaning kits and the Otis is a smaller cleaning kit for the AR. If you want to put your kit together yourself, then you will be spending about double the money but it is fun to do. I have done this a few times thinking that I could save money by avoiding a kit but that’s not usually the case. 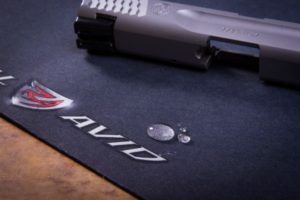 I have the Real Avid AR gun cleaning mat and really like the magnetic sides. You can put your tools and gun components in there and they stay right where they are. The AR-15 gun mats have a diagram of each component on it which is great for beginners who are unfamiliar with their firearms, telling you how to clean each piece. Keep in mind that while cleaning your AR, it’s a great idea to use a gun vise to secure it. This will help prevent you from damaging the rifling. It’s actually pretty easy to damage the crown and rifling if your AR is not properly secured, which is why a gun vise is almost necessary for cleaning an AR. One of the best investments you can make with your AR is a good Carbon removal tool like the Combat Application Tools barrel scraping tool. This will save you a lot of time because it can be nearly impossible to fully clean your AR of all carbon buildup. 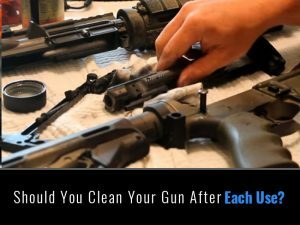 You shouldn’t need to clean you AR as often as most other guns and often times only require a good cleaning with a bore snake and your favorite tool. Of course once in a while you’ll want to do a full clean with your kit when you start to see a lot of gunk start building up. In general though the AR is much more less prone to intense cleaning and you shouldn’t be cleaning it very often.